Yesterday I went for a walk as I often do. Normally I have in my head the route I will take, this being chosen as I put on my shoes and go through the various several routes I have taken over the previous few years. This was also the case yesterday and as I set out I had pre-selected one of the shorter routes. But about 15 minutes into the walk, as I was walking through my local park, a thought suddenly occurred to me. This thought was that my next hour had been planned out in my head ahead of time by my decision. By pre-selecting the route I knew where I would be going, probably what I'd see, etc. I thought about this as I kept walking and compared it to what would be case if I'd not pre-selected my route and just set off at random, not deciding ahead of time which direction I would take at junctions and, therefore, not knowing where I'd be going. The second option seemed suddenly more attractive, especially the not knowing and the consequent unfolding surprise such a walk would be. I was coming to the path at the bottom of the park where I would be forced to turn either left (as I'd preselected) or right and suddenly in my head there was a jeopardy for, suddenly, I imagined not knowing which way I would go. I thought to myself that I would go left anyway, as I wasn't feeling particularly energetic and this way was the shortest. I settled into this idea for a minute. But then the possibility of turning right and going the longer, unprepared for, way began to reassert itself as a possibility. I vacillated back and forth, not knowing what option I would take. Then, annoyed with myself, I determined to stop this nonsense, enjoy the moment of my walk and let a momentary decision decide when I actually got to the point a few hundred meters ahead of me when I would have to make a choice. I did notice, however, that the rest of the walk then became better as a result of this choice, this not knowing what would happen, this living in the moment rather than having my immediate future pre-planned and decided. The last book of the Christian bible and so, logically, the culmination of the bible's story, is a vision of a cosmic war. One of the things this book describes itself as is a prophecy by which, in common parlance, we take it to mean a foretelling of the future. It is a fact you may become aware of in the unlikely scenario that you ever take a course in biblical studies that "prophecy" is not usually regarded as "foretelling"; its more a case of "forth telling" but I digress. In any case, should you be one of those who thinks of prophecy as foretelling the future then Revelation presents itself as the story of the end of the world, the way God wraps up the whole story of this creation he has, according to the script of the bible, made. It is not a pleasant scene. 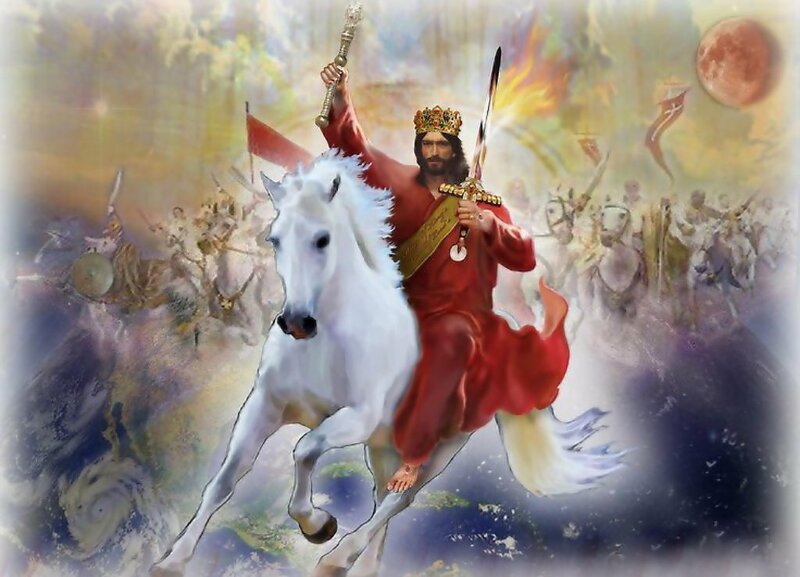 Here God sends his champion, that Jesus fella who was formerly in the bible saying "Blessed are the poor," healing sick people and telling people to turn the other cheek, on a big white horse to slaughter all the unrepentant people who don't believe in God. Basically, what we have is the notion that, at the end of all this "God is love" business you might have heard of, God is actually just going to kill all the people who haven't done what he wanted. Its divinely sanctioned violence. That is the story of the world, that is our future foretold. Now as with my walk, I'm not too happy about this when I realise that someone has written a story in which "the end" is apparently foretold. (Put aside the question of if its true or not. Its not, but that doesn't matter.) In my new, post-realisation mind set, not knowing things gives a better opportunity for a fresh look at and appreciation of life than one that is planned out. And then there is all this violence business. Its bad enough that actual people will be violent to each other without the gods joining in. But do I have this the right way round? I wonder how many Christians over two millennia have read Revelation, seen that the way the story ends is by God killing all the bad guys, and then thought, "Well if that's what's going to happen in the end anyway then what's the problem with dusting off a few unbelievers right now?" Since Revelation was written we have had Crusades and an Inquisition and I sense a latent desire from some good old white Christian boys across the water (and not just across the water) to kill the unbelieving Muslims because they are on the wrong side of this pre-decided history. Preachers of hate such as Britain First, a ragtag band of self-aggrandizing troublemakers made more famous when Trump retweeted their error-strewn material, have expressly used "Christian" imagery in their ideological war against immigrants as, apparently, it is their lack of "Christian values" that marks them out as not like us the most. Which "Christian values" are these, I wonder, the ones from Revelation where all the ones not on our Christian side will be slaughtered for making the wrong choice? So there is a problem with divine violence in Revelation and its not a Muslim problem or a problem of any other religion (although I won't deny their problems with a similar thing either): its a Christian problem. Revelation, so at least two New Testament scholars I respect have said, is "the most violent book in religious history." The problem is that by telling us the violent end of the story this book has apparently mandated violence in the name of its God and religious violence is probably the most insidious form of violence for how do you stop someone convinced that a divine being has authorised their activities? As I intimated before, its only bumping up the schedule if we good Christians dust off a few bad guys now, its not fundamentally changing the script. And what's worse, God is actually shown to be approving of violence in Revelation. Revelation acts as a divine endorsement of divine violence. Jesus, that nice fella from the gospels who was, in the time-worn phrase, "meek and mild" is not very meek and mild in Revelation. He is a Terminator or a Predator hunting down all the people who don't follow a certain religious path. And chopping their heads off. No more "King of Kings," he is now "Warlord of Warlords". In fact, as someone who has worked on "the historical Jesus" at university for PhD studies and written a couple of books about it, I don't recognise this guy. Whoever wrote Revelation has a massive hard-on for killing and death for Revelation is a major revenge fantasy. They've taken Mr Meek and Mild and turned him into a violent killer and called it "good news"! I mentioned earlier that, of course, Revelation is not true. I also said it didn't matter because, as with any literature, what matters is what it disseminates and motivates and not whether its true or not. Things don't need to be true, they just need to be believed. Have we not learned this lesson by now? Does it matter if Revelation is true if Christians across the centuries see in it a warrant to kill the enemies of God? I imagine the writer of Revelation never figured as he wrote his revenge fantasy of the Christians beating their persecutors that before too long the Christians would actually be running the show and could begin the timetable of Revelation a bit early. Oops. But there we are, what's done is done. I do wish, however, that the writer had not decided to tell us the end before we got there because, in a way, he has ruined everything and there's blood on his hands. In retrospect, isn't it just better not knowing and trying to enjoy each moment we get without worrying about ultimate destinations? Do we need to exist in our own version of the Final Destination films where we know there will be a grisly death and its shadow blights everything we do? Ends can always cast mighty long shadows and not really for any good. At least, that's how it seems to me. So, there are some stories we human beings probably shouldn't tell for, in the end, we cannot blame gods for them. Revelation, on the face of it a tale about how God subdues and takes over everything, making it wholly divine, is actually a story about how God just becomes a man, a man like us, a man who, when things haven't gone his way, resorts to killing to resolve his problems. Revelation is a book which shows God as very manly, aggressive and violent. Go on son (of God), knock him out! We here on planet Earth still have our own violence problems, of course, and many still envisage themselves or their countries as in a violent struggle for resources as, apparently, that people from one country prosper and survive is more important than that people from another one do. I wonder where such people see their story ending and what destination they have pre-selected? Is it in Orwell's perpetual war of 1984? On the other hand, don't tell me. I don't want to know.